HOW MANY BOX TOPS CAN YOUR CLASS EARN? Now through February 15, EEHSP will be collecting and counting all of the box tops turned in for each class. The top class in each grade will receive a special prize! Cut box tops off of your favorite participating products. Put them in a Ziploc bag and send them to your homeroom class. 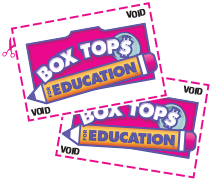 Put your box tops in your classroom envelope to see how much your class can earn!